I love creative teacher gifts and my daughter is just starting Kindergarten! So when I saw About a Mom recreate Happy Clippings pencil flowers I knew what my daughter would be bringing to school for her new teachers. 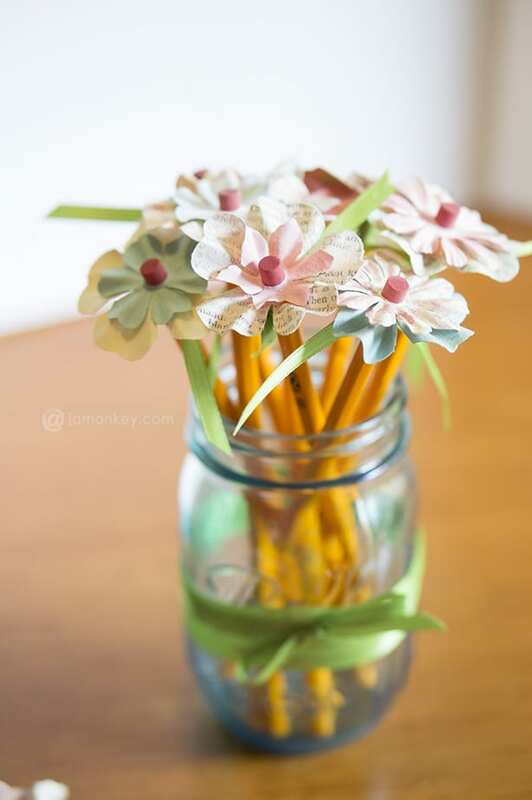 These pencil flowers are so easy to make you can do them in 30 minutes! Now, I don't own a flower punch and I couldn't justify spending $24 on one for this single project. So instead I found the perfect solution. Precut paper flowers from Michael's. 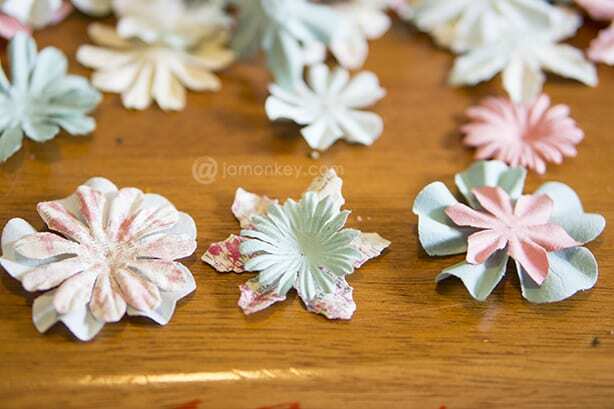 The ones pictured are the Shabby Chic ones, I picked these because some of the flowers have book print on them. I also have an oversized hole punch that was the exact size of the eraser, making it easy to slip the flower on. You'll also need wooden pencils, Elmer's glue and green ribbon. I pulled out all of the flowers to pick which ones I wanted to place together. I used one big one and a smaller one on top. The pastel colors and book print just looked so cute together. Punch a hole in the center of the flower. If you have a regular sized hole punch you'll need to punch two holes to make it wide enough. I then put glue all the way around the outside of the silver part so that the ribbon and the flower wouldn't fall off. I wrapped the green ribbon around to hide the silver part and then simple glued the knot so that it wouldn't come untied. Then place the flower onto the eraser. 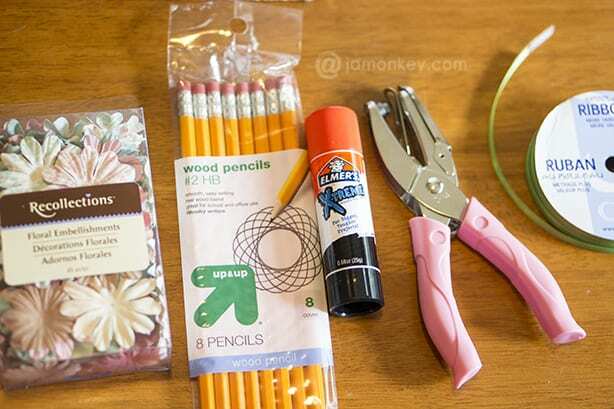 Set them in pencil holder to allow the glue to dry without squishing the flowers. We placed ours in a blue mason jar that I wrapped more green ribbon around. I think her teacher will love them! 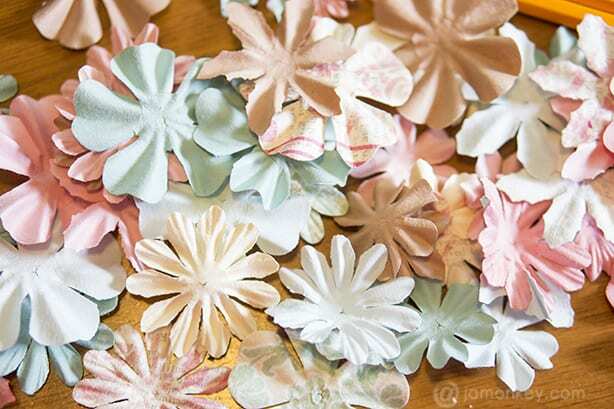 You could use silk flowers as well for this project and they may last longer. 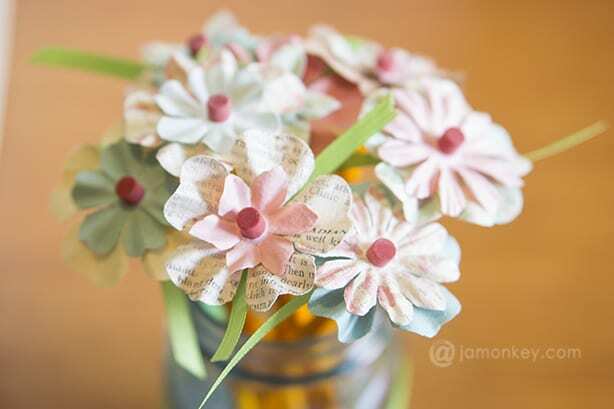 Make sure to check out About a Mom and Happy Clippings tutorials if you have a flower punch and extra scrapbook paper! Love these! I pinned it! Your pictures are beautiful! Thanks! I was so impressed with how cute they turned out and how easy it they were to make! I am going to make these for myself! My kids always steal my pencils! Oh, these are so cute! I love em! This is SO cute! My daughter walked by while I was reading this and promptly decided that we are making this for the first day! That is such a cute craft idea. I definitely will be trying it. Very cute idea! I’m sure the teacher will appreciate it. Those are absolutely adorable and they look SOOOO easy to make. Those are adorable (and still so useful). Cute! I am a retired teacher and I like your teacher gift idea! It is a great gift that any teacher would enjoy! Keep up the great work. Hug-A-Bug hugs to you! what a fun gift for a teacher!! Those are SO cute! &They sound so easy! These are adorable, and they sound easy to make. I love the idea of practical teachers gifts. Those are so cute! I’ve seen pen ones, but not pencil ones. I like the ones made from pencils better. 🙂 Her teacher will love them! what a cute craft! I bet it was a hit! I love this! I think my son would kill me if I tried to give them to his teacher though. What an adorable idea. I love the little things like this, so cute but also useful. That is so cute! What a great idea and I’m going to do this for my office. The final product looks wonderful!! Great sharing! Those are adorable – such a cute gift! 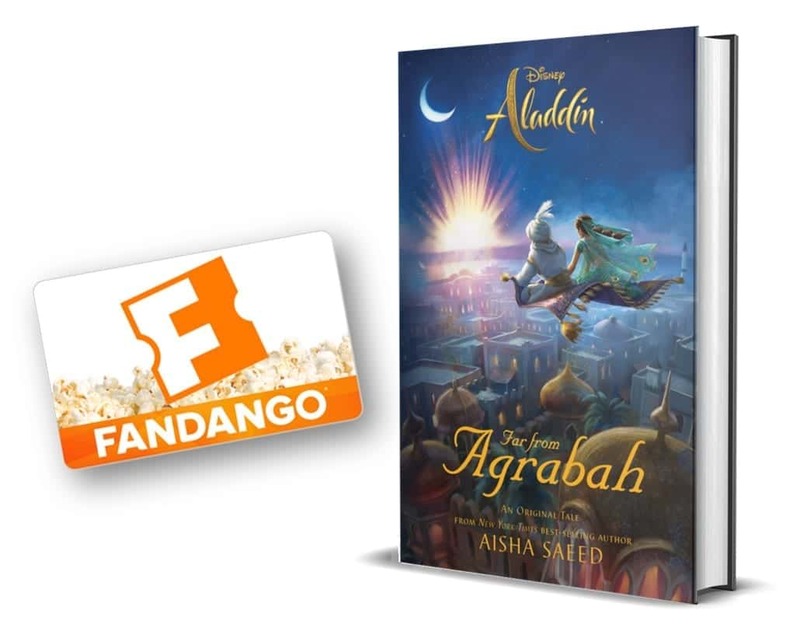 That is a pretty gift idea! This is such a pretty gift idea for the teachers and the kids could help. What a great idea,I love them I’m going to make them for myself. What a cute idea! I have lots of friends who are teachers and would love this! Those are just so cute. They came out great. Super cute and easy too! I think those are totally awesome! What teacher wouldn’t love a bouquet? Those are so pretty. I’m going to pin that for Teacher Appreciation Week and make a bunch for my son’s teachers. Thanks for the idea and inspiration! oh gosh! Those are so cute! I bet the teacher loved them. What a fantastic and simple idea. Love the ease of using precut flowers! This is so cute! I’m totally stealing this idea for teacher appreciation this year. Love this idea and I’m pinning it for future reference! This is great. I love how creative and actually really pretty they turned out. Would be great for a gift at Christmas time. I love this idea!! Actually one I haven’t seen before… Totally have people in mind for gifts already! Such a cute thoughtful idea..and i like the touch of the mason jar. This is adorable! my daughter loves her teachers and this would be a great and easy gift to make! 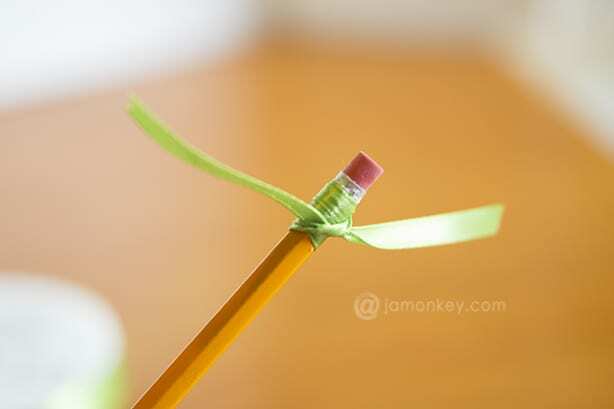 This is simple, easy and very good activity for kids, specially if you want them to be crafty! Thank you so much for sharing, I am searching for anew activity that could help my kids be more creative this past few weeks ( I am trying to take them out of computer for the past week) and this blog gives me idea on our nice activity. Very creative and visually enchanting, the instruction is really simple so hopefully I could make my own version tomorrow. Thanks for taking the time to comment. I’m glad you like it. We plan on featuring lots more fun kids crafts.